Nandi Mehta tracks an opposing player defensively. 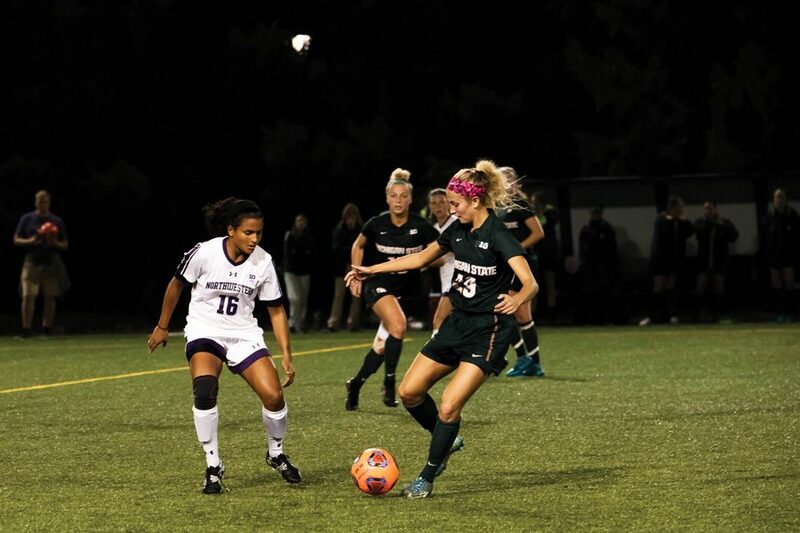 The graduate midfielder helped Northwestern to its 11th shutout of the season against Iowa. Even on one of its worst days, Northwestern had enough to get the job done. After spending most of the game trapped on defense and struggling to keep possession, the No. 22 Wildcats (13-1-1, 6-1-1 Big Ten) were able to use a second-half goal off the head of junior midfielder Kim Jerantowski to secure a 1-0 win over Iowa (7-9-0, 1-7-0). NU’s defense continued its run of dominance by securing its 11th shutout of the season. The back line pulled off impressive feats of last-ditch defending, highlighted by sophomore defender Hannah Davison’s lunging save in the 17th minute to bat away Iowa forward Rose Ripslinger’s shot at an empty goal. Graduate defender Kaitlin Moore emphasized the Cats’ willingness to bail each other out as a key aspect of their defensive triumph over Iowa. Although the defense was solid as ever, the Cats’ transition to attack wasn’t at the same level. Throughout the first half, NU made great stands on defense and then immediately lost the ball after crossing into the Hawkeyes’ half. Coach Michael Moynihan said the Cats’ inability to put high pressure on the ball was the reason for NU’s problems getting forward. The game seemed to be heading for a scoreless draw, but as the second half opened up, a new NU team emerged. The Cats were able to put together consistent chances and pushed Iowa back on its heels for the rest of the game. Moynihan said the key to NU’s aggressive play in the second half was junior Nikia Smith’s move from defense to central forward. Her presence was immediately felt up front, as her speed pressured the Hawkeyes’ back line. Smith’s performance was capped off by a spectacular assist off a cross to Jerantowski, who nodded the ball into the net in the 57th minute to give the Cats the lead. Now in a tie for first in the Big Ten and with Smith as a new attacking threat, NU will look to build on the victory with a matchup against Nebraska. With Huskers’ forward Jaycie Johnson near the top in the Big Ten in scoring, Moynihan said his team will face a different challenge Sunday.